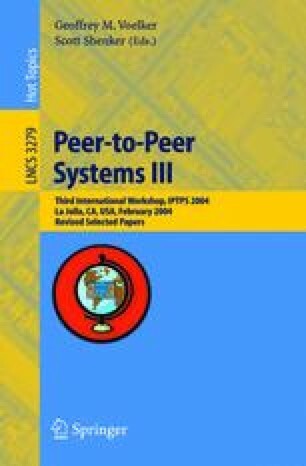 Popular P2P file-sharing systems like Gnutella and Kazaa use unstructured network designs. These networks typically adopt flooding-based search techniques to locate files. While flooding-based techniques are effective for locating highly replicated items, they are poorly suited for locating rare items. As an alternative, a wide variety of structured P2P networks such as distributed hash tables (DHTs) have been recently proposed. Structured networks can efficiently locate rare items, but they incur significantly higher overheads than unstructured P2P networks for popular files. Through extensive measurements of the Gnutella network from multiple vantage points, we argue for a hybrid search solution, where structured search techniques are used to index and locate rare items, and flooding techniques are used for locating highly replicated content. To illustrate, we present experimental results of a prototype implementation that runs at multiple sites on PlanetLab and participates live on the Gnutella network.